greens, tofu and artichoke pie. this pie is one of the most satisfying and crowd-pleasing dishes i've made in a while: healthy, flavorful, and filling. the key is knowing how to work with phyllo dough. i've always been intimidated by the thin, fragile sheets that seem to predictably crumble in my fingertips - that is, until i learned that all you need to do is let them thaw at room temperature for about 2 hours before cooking. defrosted phyllo sheets are way more workable and unlikely to fall apart in your hands. it also helps to have a sous chef at your side when layering the sheets atop each other. this is the kind of pie to serve a non-vegan crowd. the mix of cumin, oregano, toasted pine nuts, and kalamata olives give it a nice kick, and the tofu nutritional yeast combo sufficiently bulks it up. i used swiss chard and arugula for this recipe, but any greens would work well. these ingredients bake inside a warm flaky crust that steams when you remove it from the oven. served it with a simple salad of little gems and tomatoes, it makes for a lovely late summer meal. heat a teaspoon of olive oil in a non-stick skillet over medium high heat. once the oil is hot, sauté the onion, garlic, and chard stems for 3 minutes. add the chard greens and cook until they are completely wilted. set aside. while the chard cooks, mash or finely chop the tofu. dump the tofu into a big mixing bowl, and add in the nutritional yeast, oregano, lemon juice, olives, cumin, artichokes, pine nuts, and the spinach mixture. mix well. salt and pepper to taste. preheat the oven to 375 degrees fahrenheit. lay a sheet of parchment paper on a baking sheet that is at least 8x8. once the phyllo dough has been thawing at room temperature for at least an hour, unwrap the dough and cut it in half lengthwise. put half in the fridge, and set the other half beside the baking sheet. lay a sheet of phyllo atop the parchment paper, spray it lightly with oil, and repeat the process until you have 6 sheets in the bottom of the pan. pour the spinach-tofu filling into the pan, spreading it to completely cover the phyllo. repeat the phyllo process, covering the filling with six more sheets, spraying each one lightly. spray the top sheet of phyllo. put it in the oven and bake for about a half hour, until the top is lightly browned. cut into squares and enjoy! 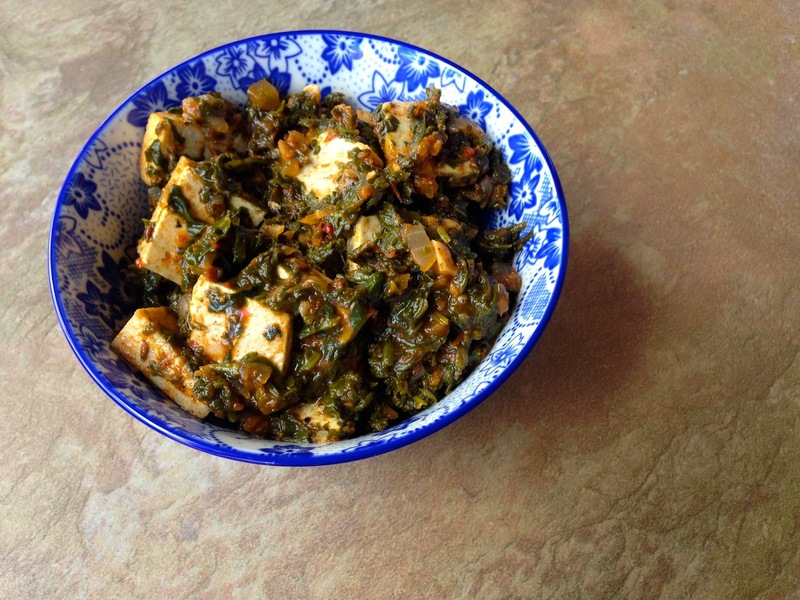 palak tofu with fire-roasted tomatoes. i've found it: my new favorite greens dish. 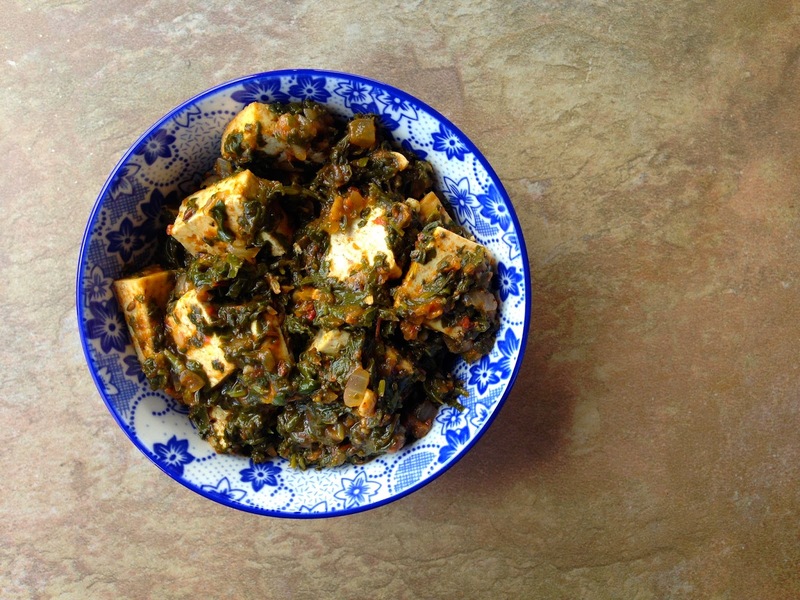 while i would never dissuade you from my trying my earlier saag tofu recipe, this newer version comes together much quicker and with fewer ingredients, making it an ideal weeknight recipe. from start to finish, this dinner will take you no more than forty-five minutes to throw together. i piloted the recipe using spinach but look forward to trying it out with kale or chard next time around. serve with some rice, dal, and naan for a hearty, well-balanced meal. prepare your tofu by first removing all of the excess water. you can do this by wrapping it in paper towels and setting a plate or something heavy on top of it for a couple of minutes. repeat as necessary until it feels firm and dry. heat one tablespoon of oil in a large skillet over medium high heat. once your oil is hot, toss in the cubed tofu and pan fry until lightly browned on both sides. when it’s cooked, add a pinch of salt and pepper, stir, and then dump into a small mixing bowl to cool (note: you could also do this step in advance to save time). in the same skillet, heat a tablespoon of oil over medium heat. sauté the onion until soft, about 8 minutes. push the onion to the side of the pan and add the cumin seeds. stir the cumin seeds around in the middle for about a minute so they can crackle and pop. add the garam masala, ground coriander, ginger and garlic. sauté everything together for 2-3 minutes. add the fire roasted tomatoes and sauté for another 5-10 minutes. now add the spinach, a few handfuls at a time, to the mixture. to help the leaves cook down, keep scooping the tomato mixture over the greens. when all of the spinach is cooked, add the fresh cilantro to the skillet. sauté for another couple of minutes. transfer the mixture to a blender or food processor. pulse a few times until you get the desired consistency. I like mine mostly smooth with a few chunks (not pureed). return the mixture to the skillet, and stir in the water. add the salt, pepper, and tofu. simmer for 5-10 minutes. serve immediately. "it's been way too long since my last post" would be a severe understatement. rather than starting off by making excuses about my unannounced five month blogging sabbatical, i'll jump right to the chase (and save the excuses for my next post, which hopefully won't take another five months to publish). the chase: make this cake! place a rack in the middle of the oven; heat to 350 degrees. grease a 10-inch bundt pan, including center tube, if you have one. i just used a deep 9-inch square baking dish. in a large bowl, whisk together the flour, baking powder, baking soda, salt and spices. in another large bowl, whisk eggs well. whisk in the sugar, oil, honey, and wine until well combined. whisk in your dry ingredients until smooth. pour the batter into pan and bake until a cake tester comes out clean, 45 to 50 minutes. transfer pan to a wire rack to cool for about 20 minutes. remove from the dish and allow to finish cooling. slice and serve! squash, pomegranate and hazelnut salad. you can make this incredibly versatile dish with any squash or vegetables you have on hand. the sweetness of the pomegranate, the crunch of hazelnuts, and the bite of the dressing pretty much make the salad. preheat the oven to 375 degrees. toss the squash and leeks in 1 tbsp olive oil and season with salt and pepper on a baking sheet. the leeks and squash require different amounts of time to roast, so try to keep them separate on the sheet. roast the leeks for about 20 minutes and the squash for 30-35 minutes. check on the vegetables regularly and toss as needed to avoid burning. while the veggies are roasting, place the hazelnuts in a shallow baking dish and toast them in the oven for 4-6 minutes (or until golden). alternatively, you can toast them dry in a pan on the stove top for about 3-4 minutes over medium heat. let the nuts cool, chop them roughly, and set aside. make the dressing by whisking together the olive oil, mustard, lemon, maple syrup, salt and pepper. in a large serving bowl, pour the dressing over the greens and them well with your hands until they are coated in the dressing and take on an almost wilted texture. add the pomegranate seeds, hazelnuts, and cilantro. once the squash and leeks have finished roasting and have cooled for 10-15 minutes, add them to the salad. give the entire dish a big toss, add some salt and pepper to taste, and serve.